Learn how to automatically post images to a Facebook business page. IMPORTANT NOTE: The Facebook automatic business page upload feature will only upload NEW images your Facebook business page. It will not upload pre-existing images from your watch folder. This is to prevent duplicate images being uploaded in various scenarios. Test your Facebook business page uploading by saving a new image in your watch folder after starting your device server. 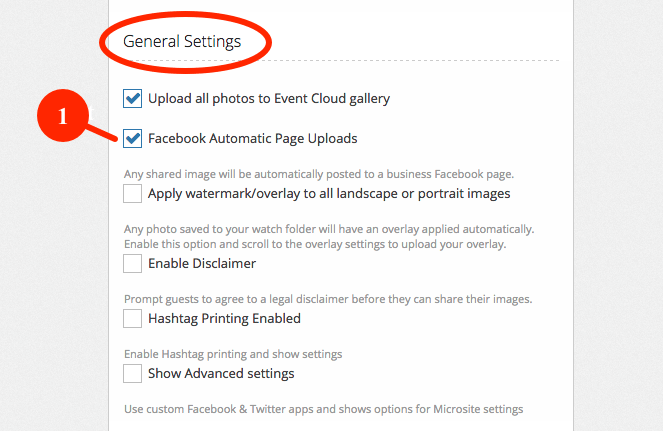 Scroll down to General Settings portion of your event and enable the check box for Facebook Automatic Page Uploads. Scroll down to the Facebook Business Page Automatic Uploads section. IMPORTANT NOTE: If you do not see the "Send Facebook Page Request" button then please update/create your event and then edit it again. When you edit the event you will then see the "Send Facebook Page Request" button. Click Send Facebook Page Request - This will send a request to the email address provided. A link will be included in the email that will allow you or your client to login to Facebook and select the page they want you to have access to for uploads. Enter the email you are sending the request to and press Send Email. This email is requesting the user to log into their Facebook Business page and to authorize the PicPic Social application to post on it's behalf. Once the request has been sent please scroll to the bottom of your event settings page and update your event to save your settings. Click on the link in the email to get started. Click ‘Choose’ on the page you would like to authorize PicPic Social to use for auto uploading your event photos. When you or your client completes this step, you will receive a confirmation email letting you know the event has been updated. Verify that the correct Facebook business page is listed under the Facebook Business Pages With Access section (The Red X to the right allows you to remove the page if necessary).